The Maidenhead Royals capped their 2015 Tournament campaign by claiming the C-Grade Diamond Series title. The Diamond Series is played over 3 events, by 24 teams from all over the UK. Points are award for positional finishes over the three events. The Royals campaign began back in May with a very successful first day. Winning all their first round matches, put the Royals into main knock-out competition and an early win on day two over Farnham Park put them in the semi-finals. That game was the only one the Royals lost over the weekend, going out to the Oxford Oddsocks, who would go onto in the competition. A 3rd/4th Play-off win over the Vampire Batters, end the weekend for the Royals as 3rd overall and with a 7-1 record. 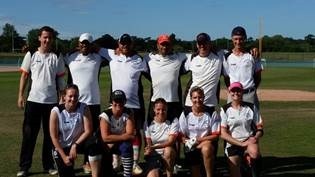 The second Diamond tournament didn’t start well for the Royals, losing their opening game to the Lucky Strikes, however they recovered well to win the next 3, but a late defeat on that first Saturday did look to have ended any chance of a top 8 finish. However, the Royals group was very tight and thanks to wins over the teams vying for top spot the Royals went into the Cup competition as group winners. That second Sunday saw the Royals play some of their best softball of the year, starting with an emphatic win over United Nations to semi-final against London based Death Stars. In a dominate display the Royals over powered the Death Stars to face the other unbeaten team, London Flames, in the final. A final that went right to the final inning and final two outs, at 17-17 a solo home run in the bottom of the 7th saw the Royals over the line and take a lead in the overall series. Holding an 11 point league in the series going into Diamond 3, the Royals made a positive start on the Saturday and with a 4-1 record achieved the first objective of the weekend and reaching the last 8. The quarter final that followed was effectively the championship game. London Flames were the only team left in the competition who could win the title over the Royals, so the quarter-final was a winner take all. In no less an epic game, the Royals came out on top to clinch a 3rd semi-final slot and guarantee the series win. A final win over London Raiders meant the weekend ended with a second consecutive final appearance. Although the tournament didn’t end with a second final win, 2nd place was more than enough to go one better than 2011 and give the Royals their first Diamond Series victory. Missed Parts 1 to 8? Club Review of the Year Part 6. Royals Rollercoaster League Year. Co-ed slowpitch softball is a social and enjoyable game that’s easy to learn and play, even for people who are not “athletes” or don’t have much experience of team sports. Softball is a lot like baseball in terms of the rules, but because the ball is pitched slowly to each batter (as the name implies! ), it’s easy to hit the ball and succeed at the sport’s central skill. The fact that men and women play together in the same team and on an equal level gives the sport a social buzz, and most softball games are followed by sessions at the local pub! 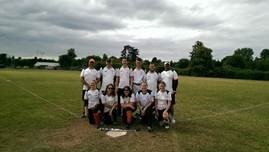 Maidenhead Softball Club runs weekly sessions every Friday at Newlands Girls School in Maidenhead. Sessions from 6pm until 7:30pm and are open to anyone 11 and up. All sessions are free, no experience needed and all equipment to get you going is supplied. For all under-18’s attending, a parent must be in attendance at the beginning of the first session to sign permission paperwork. This entry was posted in Club News, Diamond 1, Diamond 2, Diamond 3, Royals, Season Review, Tournaments and tagged Diamond Series, Maidenhead Royals, Royals, Season Review, Softball, Try Softball on December 18, 2015 by maidenheadsoftballclub. Season Review Day 12. Back where we started.